When polymer mixtures become increasingly complex, the conventional analysis techniques become insufficient for complete characterization. 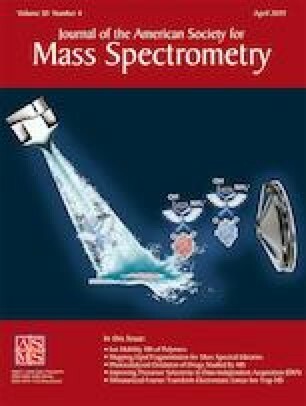 Mass spectrometric techniques can satisfy this increasing demand for detailed sample characterization. Even though isobaric polymers are indistinguishable using simple mass spectrometry (MS) analyses, more advanced techniques such as tandem MS (MS/MS) or ion mobility (IM) can be used. Here, we report proof of concept for characterizing isomeric polymers, namely poly(2-n-propyl-2-oxazoline) (Pn-PrOx) and poly(2-isopropyl-2-oxazoline) (Pi-PrOx), using MS/MS and IM-MS. Pi-PrOx ions lose in intensity at higher accelerating voltages than Pn-PrOx ions during collision-induced dissociation (CID) MS/MS experiments. A Pn/i-PrOx mixture could also be titrated using survival yield calculations of either precursor ions or cation ejection species. IM-MS yielded shape differences in the degree of polymerization (DP) regions showing the structural rearrangements. Combined MS techniques are thus able to identify and deconvolute the molar mass distributions of the two isomers in a mixture. Finally, the MS/MS and IM-MS behaviors are compared for interpretation. The online version of this article ( https://doi.org/10.1007/s13361-019-02173-y) contains supplementary material, which is available to authorized users. The authors acknowledge the financial support of the F.R.S.-FNRS (FRIA). R. Hoogenboom acknowledges financial support from FWO and Ghent University.